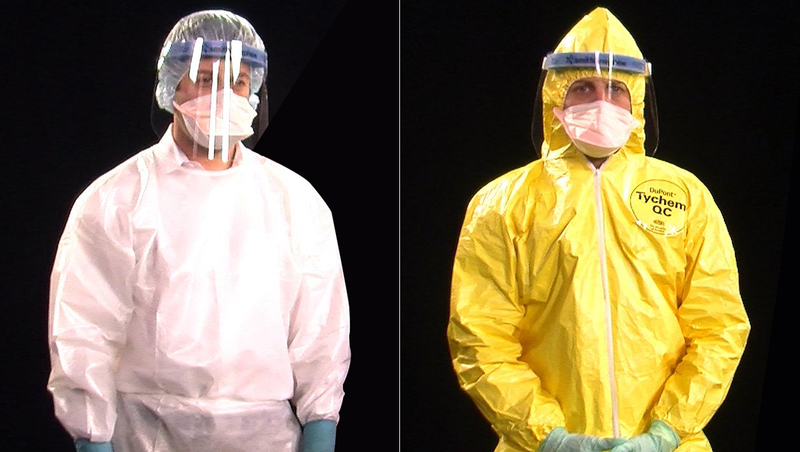 What should Ebola health care workers wear? As two nurses from Texas Health Presbyterian Hospital who helped care the first U.S. Ebola patient now battle the deadly virus themselves, federal and state health officials are trying to determine how to more effectively keep health care workers safe. This requires extensive training and the right personal protective equipment, also known as PPE. There are a number of different PPE options that offer different levels of coverage and risk. More is not always better, and there are a number of potential pitfalls. Dr. Michael Reilly, director of the Center for Disaster Medicine at New York Medical College, told CBS News that many hospitals are wrestling with what type of gear to provide to their medical staff. The U.S. Centers for Disease Control and Prevention recommends health care workers treating Ebola patients adhere to the agency's Recommended Standard, Contact and Droplet Precautions, he explained. This ensemble includes two layers of gloves, a liquid-impervious surgical gown and boots, hair covering, mask and face shield. In most instances, the CDC recommends health care workers replace the basic surgical mask with a more protective N95 particulate respirator. This disposable filter forms a tight-fitting shield over the nose and mouth, and screens out 95 percent of airborne pathogen particles that are greater than 0.3 microns in size. The respirator is especially important when performing medical procedures that may increase the potential for exposure to infectious bodily fluids. "Aerosol generating procedures could be anything like administering a nebulizer to a patient, to intubation, or placing a patient on a ventilator, suctioning secretions in or around their mouth, performing a bronchotomy or lung exam or biopsy. That would result in a provider being very close to a patient and where you would have sputum or other biological fine particles coming into the breathing zone of the provider," said Reilly. "In that case, that's when you increase the level of respiratory protection to the N95 over the surgical mask." This set of gear is tested and certified by the National Institute for Occupational Safety and Health, part of the CDC, to protect health care workers from an array of infectious diseases. However, in the current Ebola crisis, this standard of PPE may not be enough. "There is concern among health care providers about whether or not this particular ensemble is sufficient in protecting them against Ebola exposure," said Reilly as he demonstrated the "donning and doffing" procedures for standard PPE with his colleague, Jared Shapiro. "One of the limitations is some skin exposure -- back of his neck, collar of his shirt, hair -- potential routes of splash or inadvertent aerosolization of infectious material could come in contact with him." This is why Ebola clinics in West Africa and high-containment medical facilities such as Emory University Hospital in Atlanta -- where two American missionaries were successfully treated for Ebola and where Texas nurse Amber Vinson was transferred on Thursday -- have opted for what Reilly calls "enhanced precautions for high-risk health care workers." This ensemble also includes inner and outer pairs of gloves, but instead of a gown, the body is almost completely covered by a one-piece fluid resistant suit, which often has a hood to protect the neck as well. It's worn with a N95 respirator and face shield. Reilly said that while a small area of skin may still remain exposed, the suit provides more overall protection. But simply having all this equipment isn't enough. The suits, masks, respirators and gloves must fit each individual properly. If a respirator is too big, it could gap around the nose and mouth. If a suit is too small, it could rip when a person stretches their arms. Either could increase the risk of infection. Reilly said that often employees are fit-tested only when they begin to work at a hospital, which means any weight gain or loss in the months or years that follow won't necessarily be accounted for when the equipment is actually needed. Even minor changes -- like a slight growth of facial hair -- can interfere with a respirator fitting properly. And then there are the challenges that come with the process of "donning and doffing" all this equipment properly. "It's rare that health care workers will be able to do this by themselves effectively 100 percent of the time," said Reilly. "That's one of the reasons why we always emphasize in all types of training programs with infection control procedures and personal protective equipment that you have a buddy or a partner that helps dress you and checks you to make sure that you've done it appropriately, and everything is covered and sufficiently protected to do whatever the job is that you need to do but also in the environment of that pathogen." Special care needs to be taken in removing layers of protective gear after treatment to avoid spreading contamination from one surface to another or inadvertently brushing against bare skin. Again, a partner trained in infection control can help avoid shortcuts or slip-ups. Another option involves adding a hooded powered air-purifying respirator (PAPR) to the enhanced precautions outfit. The PAPR is comprised of a rubber hood with a full face shield, whose two layers allow one to be tucked into the suit. The air filter system has a vacuum motor, filtration cartridges and is run on 8-hour batteries, all of which help to provide a "cool breeze into the hood which is helpful for heath care providers who are wearing PPE for an extended time," Reilly said. But wearing this respirator can be overwhelming, especially for a newly-trained, weary health care worker. "It is stressful and humid to be in a fluid-impervious garment," Reilly noted. "It's possible his heart rate and blood pressure will go up, and he would have to have specific training on the use of this respirator and this whole system as well as being in this suit. "And we would have to be very diligent in monitoring him medically to make sure he wasn't becoming faint or dehydrated and that the physiological stress of simply being in the warm suit for an extended period of time wasn't detrimental to his health, because there are other risks associated with treating highly infectious patients, other than simply contracting the pathogen. It's important to keep that in mind when you're protecting the health care workforce."